SafetyWorks! : No-charge, confidential consultations designed to reduce job-related injuries, illnesses and deaths—not OSHA and no fines are assessed. 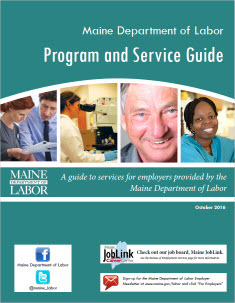 Maine Apprenticeship Program: Connects job seekers and workers looking to learn new skills with employers looking for qualified workers; earn while you learn. Maine JobLink: List your job opportunities at no charge and get matched with job seekers in your area. Job Fairs: Meet with hundreds of prospective employees throughout the state. Work Opportunity Tax Credit (WOTC): Get a federal tax credit when you hire workers from targeted groups that have consistently faced significant barriers to employment.